A beautiful stately home, but at what price? I'm sure everyone who watches Downton Abbey dreams of living in such a beautiful and historic home (generally upstairs, rather than downstairs!). As we know from countless television dramas, however, the beautiful stately home can hide terrible secrets. 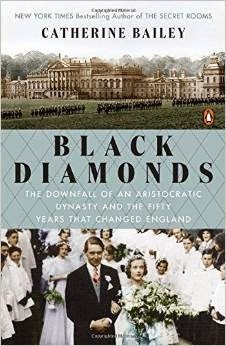 The book Black Diamonds looks at the intriguing background of Wentworth House in South Yorkshire, the largest privately owned house in Britain. The book contains a many intriguing aspects: an aristocratic family with secrets, a class divide, economic upheavals, and even an American connection! Built in the 1720s, the house is the ancestral home of the Earl of Fitzwilliam and at the time of its construction, the facade was the longest in Europe. The five miles of passageways were so confusing that guests had to strew confetti to find their back back to their bedrooms after dinner. The events in the book begin with the inheritance struggle that occurred in 1902 following the death of the 6th Earl Fitzwilliam. His son and heir had died in 1876, so grandson Billy, who was estranged from the family, inherited, much to the dismay of the old Earl's children. Billy's Aunt Alice, in particular, set out to prove that the odd circumstances surrounding his birth (in a remote cabin in Canada) must show that he was a "changling" -- a male child substituted for a daughter born to the heir. Eventually, Billy was declared the rightful heir and took up residence at Wentworth House. The wealth of the Fitzwilliams was based on coal. Their mines and others in the area employed over 115,000 men at the time of the 6th Earl's death. While the "family owned" mines, such as those operated by the Earl, had better conditions than most, the lives of the miners and their families were hard, dirty and poverty-filled. To make matters worse, some of the mines were operated by outsiders who had no ties to the local area or the people who lived there. They controlled every aspect of the lives of their employees, who depended on the mine owners not only for their employment but also for housing, food and drink (through company owned stores and pubs). When the owners refused to pay miners in the small village of Denaby for the time they had to clear away dirt from the mines in order to get to the coal, the miners refused to work. Eventually, the mine owners sent in the police to evict over 3000 people from their company-owned (but still shoddy and primitive) homes. In the years following Billy's inheritance, the country was torn by a series of strikes across many industries. The King and House of Lords were slow to accept that their way of life was changing and that workers were no longer going to accept such poor working and living conditions. In 1912, King George V and Queen Mary visited Wentworth House. The plan was for the king to visit one of the Fitzwilliam mines, and to show an interest in the lives of the miners. During the visit, two explosions occurred in a local mine, killing over 80 miners. While the royal couple did visit the area during the effort to recover the bodies of those who died, nothing changed in the mining industry. World War I stopped the growing hostilities between the workers and the mine owners for a time. Billy's cousin, Toby Fitzwilliam, was also estranged from the family. In his case his mother, Evie, strongly objected to his marriage with Beryl Morgan. A former chorus girl herself, Evie had no right to put on airs and reject Toby's lower class choice for a wife, but that's exactly what she did. She felt that Beryl misrepresented herself as being from a "good" family, when in fact she was only "the daughter of a draper." Evie grew so upset at the perceived insult from her son that she even suggested that he was illegitimate -- born before she and his father were married. In this way, she hoped her younger son would inherit from his father instead of the disrespectful (as she saw it) Toby. This family rift was to have consequences for the fate of Wentworth House many years in the future. After World War I, the old animosity between miners and mine owners resurfaced. There were calls to nationalize the mines, which the mine owners strenuously fought against. Fear of Bolshevism as well as a perceived war on their way of life motivated the mine owners and operators to stand firm against the miners. General strikes in the late 1920s caused unease and fear in the whole country. At the same time, demand for British coal was falling as other countries were able to provide a less expensive product. Billy and his wife Maud were the parents of four daughters before their son and heir, Peter was born. There were rumors of infidelity on the part of both Billy and Maud, and Billy was thought to have numerous illegitimate children in the village. Peter was a pampered, overweight child who was nothing like his robust and athletic father. In 1933, when he was 23, Peter married Olive "Obby" Plunket. During World War II, stately homes were requisitioned by the government for various uses, and Wentworth House was no different. Since it was so large, Billy and Maud moved into the "West Front," part of the house and made sure all valuable objects were moved there as well. Their son Peter had been called up soon after war was declared and was recognized as a brave and respected soldier. He and Olive had, after 7 years of marriage, only one child, a daughter called Juliet. Enter Kathleen "Kick" Kennedy, daughter to US Ambassador Joe Kennedy and sister to future president John F. Kennedy. She had lived in England with her family in the late 1930s, but as World War II began to seem inevitable, she and her siblings, along with their mother, returned to the US. In 1943, she came back to England as a Red Cross volunteer. She renewed an attachment she made before the war, to another Billy, this one the son of the Duke of Devonshire. They were attracted to each other, but the fact that she was a commoner (not to mention a Catholic) had put a damper on their relationship. Eventually, they married, but her family never accepted the union. When Billy was killed during the war, she was accepted back into the Catholic Church and the Kennedy family. The war had taken a toll on Wentworth House and the Fizwilliam family. The newly elected Labour government nationalized the coal industry, which meant that the rich coal seams in the gardens and fields surrounding the stately home could be mined with no payment or consideration to the family. The environmentally destructive "open-cast mining" operation dug up centuries of carefully tended parkland. The 7th Earl, Billy, had died, and Peter took over as the 8th, but the family wealth and power were waning. There was wrangling over the ownership of the house, with Peter offering it to the National Trust, but that offer fell through. Eventually, his Aunt Mabel struck a deal to allow the house to be used as a school for female PE teachers, with the family allowed to stay in their private apartments. The cost of repairs and upkeep would fall to the County Council. At this time, Peter, the 8th Earl Fitzwilliam met the widowed Kick. He was still married to his wife Obby, but their time spent apart during the war had caused their relationship to become strained. He had a well-known reputation as a gambler and philanderer, so Kick's friends were less than impressed with the relationship. Once again, her family (especially her mother) threatened a complete break if she were to marry Peter. A tragedy occurred that put Wentworth House in the center of a court battle, the outcome of which has repercussions to this day. It was so fascinating to read about the history of this beautiful house, which, because it is not open to the public, is largely unknown. While we like to think we'd love to live in such opulent surroundings, the toll on the land and families who lived there make it more of a tragic house than a beloved stately home. I really enjoyed reading about the downfall of the Fitzwilliam family, and to learn about what has been the fate of Wentworth House since the fortunes of the family and the coal industry, which supported it, have collapsed. Now in private hands, one can only hope that at some point in the future Wentworth House will be opened for the public to tour and appreciate. Disclaimer: I received a copy of Black Diamonds from the publisher in exchange for this review.